What do you use to wash my windows? How soon could you clean my windows? What happens if it is raining on my appointment day? Generally, we will work in rain as long as it is not dangerous for our employees or we feel that the rain will stop us from doing a satisfactory job. We have never had to return to fix a job that we did in the rain. What should I do if I am unable to be on-site on my appointment day? On a first service, we would prefer if the customer was there as we may need to discuss any issues we may have. On subsequent visits, while we prefer the customer to be on-site, we will wash the windows and lock up after, all that is required is an individual on-site upon arrival of the crew to allow access to the facilities. How do I know if I have storm windows? Most New Englanders know what a storm window is, but some newcomers to the area from warmer climates have never seen one. Storm windows are almost always on double-hung sash windows, and if you push up the bottom sash, another frame outside would be visible which holds two storm windows and a screen. What do you mean by “Do your windows operate correctly”? 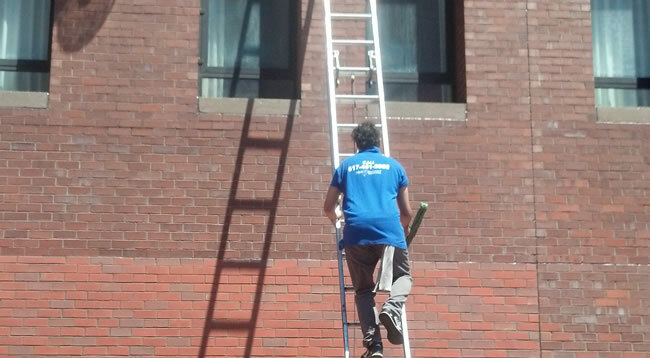 Because a lot of our work is in the Beacon Hill and Back Bay areas, where some windows are too high for even our longest ladder and there is no OSHA acceptable tie-off on the roof, we move the windows up and down to access the exterior. To do this we need the bottom sash to open completely and the top sash to move all the way down. Do you charge the same no matter the size of each window? Generally, yes, especially for storm windows or windows that need a ladder to access, as the amount of work required is roughly the same.